Margarita with her butter bread. Margarita Blanca had a dream. 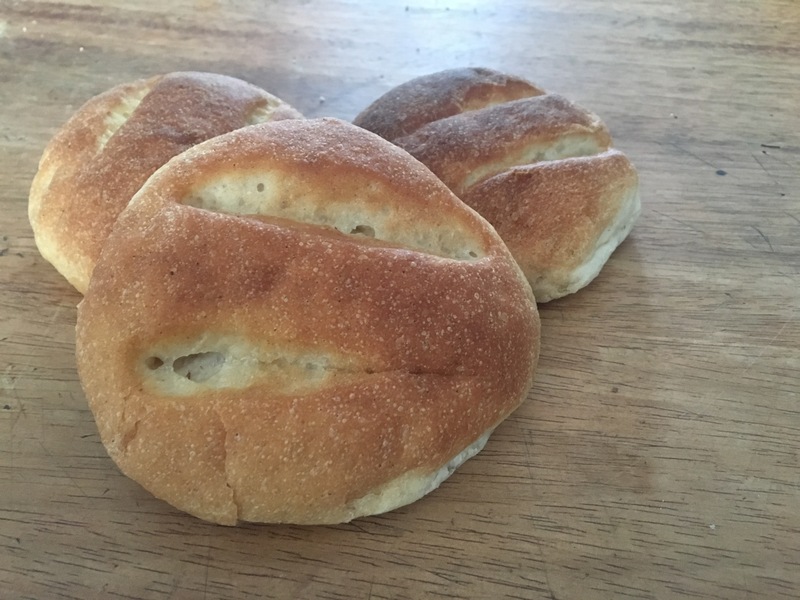 She saw the hard working women of her and the neighboring communities all working together to grind their own wheat and make it into the best, most delicious professional bread imaginable – and selling it around the region. She saw women working together, employed and earning a premium price for their wheat. She saw the mayor helping out and all communities working together to pool resources, funding and successes. She saw this but it was not happening. The neighboring community had a gas fired oven but would not share it with people outside of their community. Why should they give work to someone else – it’s their oven and they should be using it for their own things and that’s it, they explained – except they weren’t. Her own community liked the idea of a shared bakery but wanted it in their community for more secure and constant access. Margarita explained the bakery needed to be in the large town of Anzaldo, an hour away on foot, because there was where the market was. She explained that it would be easier to distribute fresh hot bread in the town, than to bring the bread to town and have it arrive cold and no longer fresh. She wanted to make and sell hundreds of breads all around the region and benefit all women wheat growers. She also wanted to in improve child nutrition and add quinoa flour to the breads. But the communities were not in agreement. Margarita did not give up. She traveled to meetings in the mayor’s office, met with developers and shared her vision with anyone who would listen. Little by little she started to get supporters: other women from her community and others, the school, the church and the mayor. But the real support needed to come from the rural women themselves. Margarita saw other communities in places such as Rachay Pampa, who had successful programs started. She knew this could happen in Anzaldo too. Her big break came in June 2016 when the Center for the Research and Promotion of Rural People (CIPCA) – a Bolivian non-profit development organization – hosted a workshop with the Anzaldo mayor and community at their annual Water Festival. 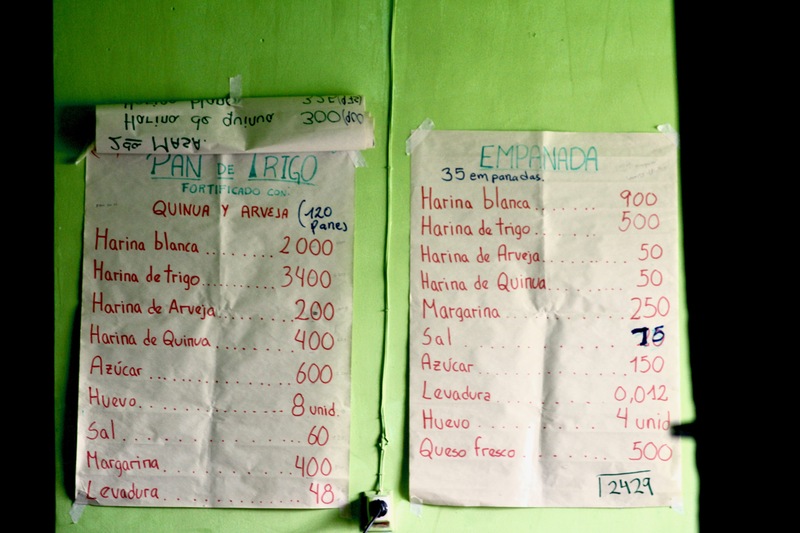 Here Margarita learned CIPCA was working with rural nutrition and could help her start her bakery! 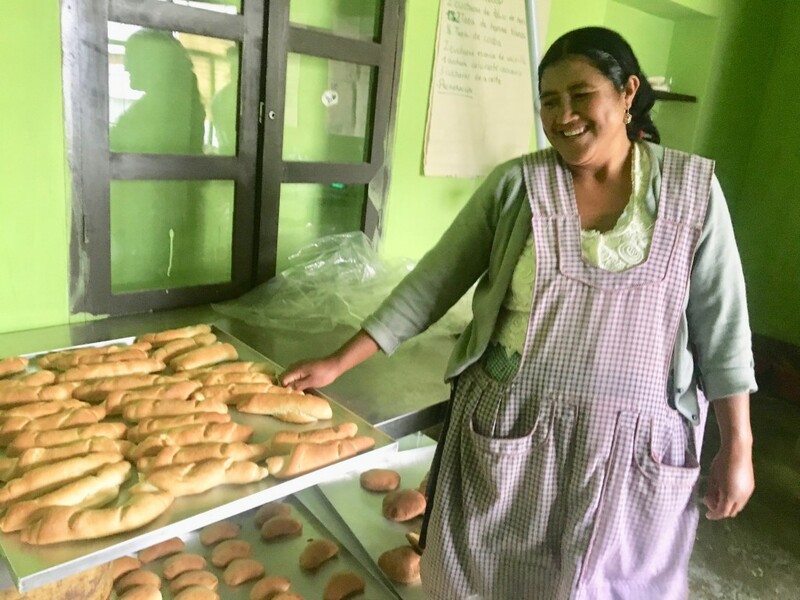 She traveled to the city of Cochabamba 2 hours away, on her own dime and time, to meet with CIPCA and present her vision for the Anzaldo bakery. CIPCA was in! The bakery idea met their goals of supporting rural development and nutrition and was an economically feasible enterprise – there was a market, infrastructure and opportunity. They gave Margarita the go ahead under the condition that she form an official women’s association and secure some financial backing from the town mayor. Within a few days, Margarita had the mayor’s attention. There was an unused medical post in town that could be lent to the women for three years – as long as they paid the utilities to use it, mainly electric lights and gas for the stove. He later gave them a 2 month grace period on their first utility bill. Margarita went from community to community meeting with the rural leaders and soliciting support for the bakery project. Finally she had seven communities (out of 15) on board. It was enough to get started! The women cleaned and painted the building a bright cheerful green, received from CIPCA a new commercial oven with electronic temperature control and the ability to not just make bread but also cakes and cookies. Bakery members each paid either 32 pounds of wheat (a $14 value) or $7 cash – whatever they preferred, to be a member of the baking association. 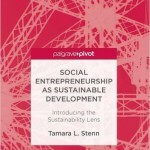 This got the women the raw materials and cash they needed to begin. The women had their local, organic wheat ground into flour and CIPCA sent down a professional baker and nutritionist from the city to help create recipes for the women. They also sent an accountant to help the women set up the books and controls for the flow of ingredients, inputs, costs and earnings. Production would be local, organic and of the highest quality. The mayor put in an order for quinoa breakfast breads to be baked for school nutrition programs. He would order 100 breads at 40 centavos each – committing an order of 100 breads delivered daily to the school. This hardly covered the cost of producing the bread, but it gave the women a space to use their wheat and produce product. The bakery officially opened in December 2016 and currently produces 120 breads a day for outside sales of 1Bs each. The women sell their hot quinoa bread in the afternoon to making rounds to the local hospital, boarding school, and main plaza the town. They have the capacity to make three times that amount but are holding off until they know there is better market access. One goal that Margarita has is to make bread in the morning. This will give here access to the most popular morning bread market. To do this she (and the women members) would need to sleep in the bakery, which has a bedroom. However, that is not allowed by husbands who need the women to be home getting the children ready for school, the farm animals ready for the day, and the afternoon meal prepared – and not sleeping in Bakeries far away. But Margarita is patient and persistent. She is confident that in time a solution will be found and the bakery can operate in the mornings producing the daily bread (instead of the afternoon snack). Future plans also include sales in the large commercial center of Cliza and a distribution in the city of Cochabamba. Besides bread, Margarita’s team makes butter rolls, quinoa bread with 17% quinoa, quinoa cakes, quinoa and cheese empanadas, and quinoa chocolate chip cookies. Women take turns working in the bakery in pairs usually putting in two turns a week and earning 20Bs a turn. Local ingredients used in the recipes include wheat, potatoes, dried corn and peas, cheese, honey and eggs. The women are paid an extra 10% for their products used in production. The women are investing their savings into a fund to pay for their own building to be built when their 3-year lease is up on the borrowed health post. Breads made with kaslala quinoa. Looking at the quinoa market from the producer perspective, the Fair Trade producer earns 4% of the total value of the quinoa they produce. Producers however, consistently say this is not enough. 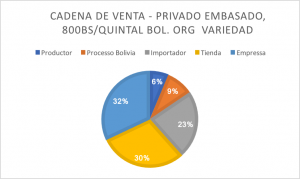 To cover production costs including their own labor, they need to earn 800Bs a quintal ($114 for 220 pounds) or $.51 a pound. 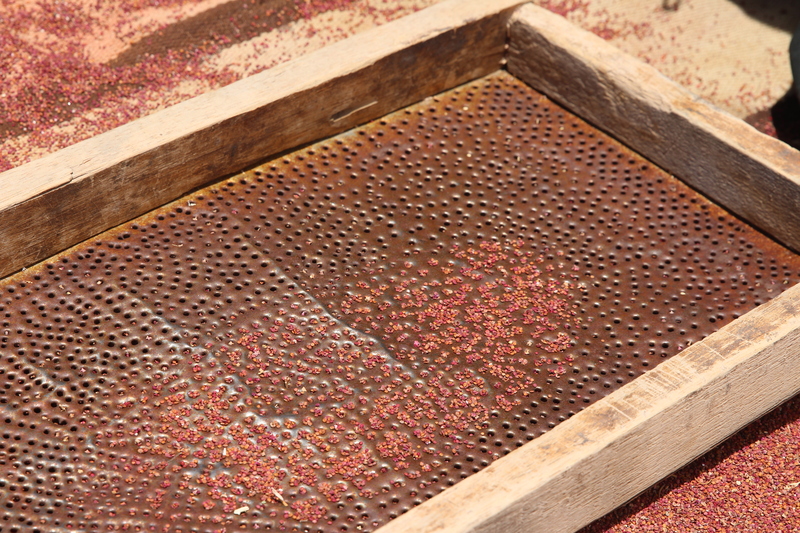 Plugging this amount into the current quinoa production costs it brings us to a FOB of $2,778 per ton. This is 6% more than the current Fair Trade price. To continue down the value chain through distribution to wholesale re-packagers down to consumer retailers, the final product arrives at a consumer price of $8.12 a pound – a 12% increase over the current Fair Trade, organic quinoa price. The proposed pricing for a pound of premium, heritage variety gourmet organic quinoa sold to consumers for $8.12 a pound and providing a living wage for farmers. My UMass students conducted a market study of organic Bolivian Quinoa Real with the Mark of Original and found consumers willing to pay up to 25% more for a premium quinoa product that has higher nutritional values and cultural connections. 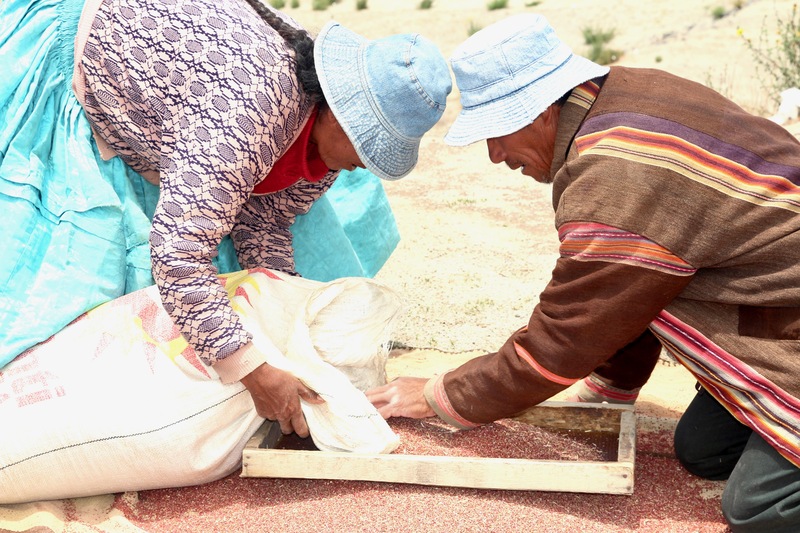 The Bolivian Quinoa Real is hand processed and 87% is blessed – both at planting and harvest – for the earth mother (Pachamama) to bring forth abundance, love and compassion for the farmers and the grain itself. 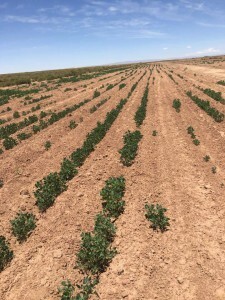 Being here in the Quinoa Real fields, I am noting that amongst the standard red, white and black varieties of Quinoa Real, there are many eco-types and sub-varieties with distinct properties and culinary uses which US consumers would value. Some like the white Kaslala are great for bread making and baking while others like the white Toledo cook quickly. Currently these are mixed and sold simply as “white quinoa” at low market prices. 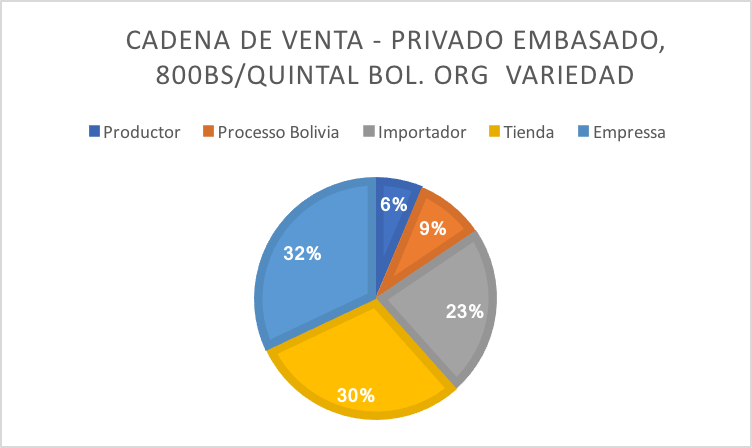 From a marketing perspective, it appears there exists a unique, profitable, premium market for the rare, distinct varieties of Quinoa Real that Bolivian farmers carefully plant and harvest, but get mixed together in the general export sales of quinoa by color. It seems that consumers are ready for the option – the challenge is to create the new market space and investment for this. Quinoa grows in tall, tight sheaths with the seeds carefully encapsulates in a tight seed head. The seeds need to be removed from this head before being brought to the quinoa processing plant for final saponin removal and cleaning. 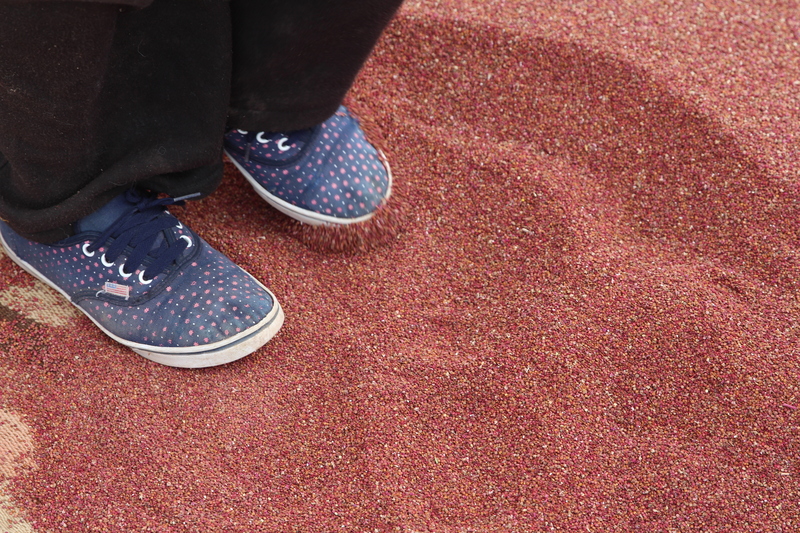 Thousands of Bolivia farmers carefully hand clean their quinoa putting many hours of work into the process, using methods passed down from generations of farmers. Celia and Miguel separate the quinoa chaff from the seeds using a sifter and the Andean winds. 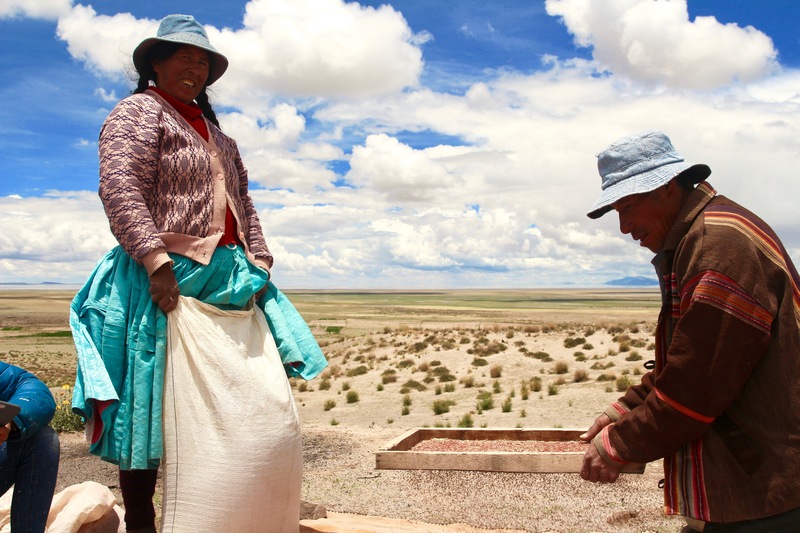 Organic, Fair Trade quinoa farmers, Miguel and Celia Huaylla are members of APROCAY a quinoa growers association that sells their quinoa to Andean Naturals, one of the largest quinoa importers in the US. I spent yesterday afternoon with them on a windy outcropping of a large lava rock, documenting the cleaning of the quinoa seed from chaf – a process I have helped out with many times on my children’s’ grandmother’s farm in the quinoa dulce growing region of Poopo. The Quillacas church bell tower offers a panoramic view of miles of flat quinoa lands – once green with quinoa, now a patchwork of green and brown as the drought took its toll on the quinoa – drying up the tiny plants or covering them with windblown volcanic sand that make up the soils that Bolivia’s famous Royal Quinoa grow in. Their daughter helps to further separate the chaff by stepping on the seeds. The seeds were previously ridden over by a tractor to break up the seed heads. Miguel laments how this does not work as well as the traditional stone threshing floors that were once used to separate the seeds – also by stepping on them. Working together to pour out more mixed seed and chaff for separation. The wind blows away the lighter chaff while the heavy seeds fall to the hand woven aguayo cloth below. The chaff and smaller, lighter seeds are fed to the family’s sheep and llamas. NOTE: This is a look back to a visit made earlier in December. I hope to visit this site again for an update before I leave in February. Walking the recently machine-planted quinoa fields. The seeds normally germinate within three weeks – if there is ample rain. Today we went with Paola Mejia Valdivia, the General Manager of CABOLQUI, the Bolivian Chamber of Quinoa Exporters, to visit an exciting new organic quinoa project they are working on with the Ayamaya community or La Paz. CABOLQUI is a Bolivian non-profit that works to promote quinoa sales to the US and Europe and is also working to get Royal Quinoa recognized – with a Mark of Denomination of Origin – as having unique properties and characteristics, that come from the rare, fragile, volcanic soils it is grown in. SIMSA a 78-year-old company that works with industrialized production and is a certified organic processor and distributor of Andean cereals for global markets. Their current quinoa products include quinoa flakes, quinoa flour, quinoa bars and puffed quinoa. Quinoa Foods – A 14-year-old organic Royal Quinoa processor and wholesale and retail exporter founded by Juan Pablo Selene and featured in my previous quinoa research. QuinoaBol – A small, regional quinoa processing and exporting company founded in 1998 by quinoa producer, Raul Veliz Mamani. Irupana – One of my favorite socially responsible Bolivian business who has been producing organic products such as honey, granola, teas and cereals since 1985. Coronilla – Another favorite of mine which for 30 years has been a pioneer in the development of certified organic, gluten free quinoa pasta and snacks. In 1996, I worked with them as an international marketing consultant with the Bolivian chamber of Small Industry. Other members include organic food processor Andean Valley, organic Royal Quinoa promoter and advocate EIPEA (cabolqui), quinoa food processing innovator CITY and market developer, Comrural XXI. Water tanks set up for spray irrigation on emerging crops. CABOLQUI works to develop all members of the quinoa production chain promoting organic production, social and ecological responsibility and the development of small farmers. 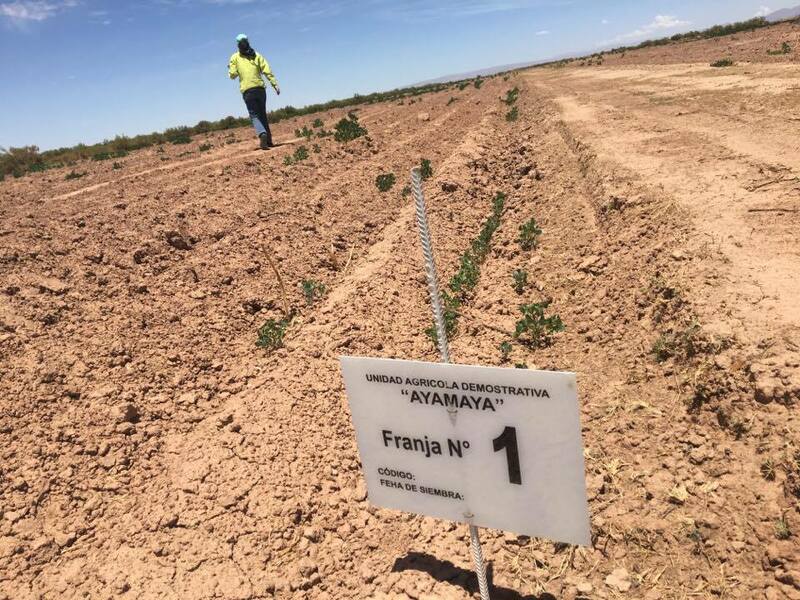 The project we visited was an innovative model of large scale, 100% industrialized, organic quinoa production located two hours outside the city of La Paz towards the traditional quinoa growing zone of Oruro. Spanning a massive (for Bolivia) 1,235 acres, it was developed under the new government title of “Plural Business.” Plural Business was developed by the Minister of Productive Development and Plural Economy as a way for private businesses and farmers to work together in agriculture innovations. Industrialized seed preparation and planting equipment. After a competitive search with 19 communities applying to be a part of this new company, CABOLQUI, with funding from its members and private investors, chose to work with 196 families in Ayamaya, outside of SicaSica, La Paz. 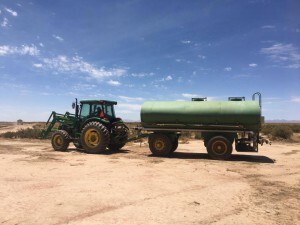 The project requirements were that the land needed to be undeveloped, certifiable as organic, with a local water source (in this case a well), flat, connected, and with favorable soil and climate conditions. According to Plural Business guidelines, individual farmers donate their lands for development and share in the production earnings 50/50 with the developers. In turn the developers assume all costs and risk involved with the agricultural land development. The Ayamaya project is a 12-year program, currently in its second year. The first year was spent strategizing the project and developing the new machines and technology for it to work. 2016 was the first year the land had been plowed and planted. Unfortunately it was also when an tremendous drought hit, upsetting the customary rain cycles needed for effective quinoa production. Never-the-less about 70% of the quinoa planted 42 days ago in November, when two small rainfalls did take place, is growing and thriving. Once germinated and about 3” high, quinoa needs very little water. It is the germination process that is precarious in times of unpredictable rainfall. 70% germinated and growing – a 2 month old quinoa parcel doing well. We traveled with Paola, a petite highly organized director who checked on other projects – verifying distribution of organic pest control to hundreds of farmers producing for the members she served – as we traveled with her and agronomists Adalir and Oscar to the site. Raised in Bolivia and educated in the US, Paola specializes in accounting and management systems. She explained the Plural Business program and patiently answered my slew of questions. After working with small farmers for so long, I was very curious about the idea of large scale organic industrialized production. Upon arriving at the project site I felt I was in another world. A huge water tower and immense water tanks greeted me. In the spirit of mechanization and innovation, the entire project is attended to by just 6 workers. We observed that it had rained up to about 100 yards from the site entrance, though the site itself had received no rain. No problem, two tractors provided sprayed water irrigation for the scores of 2.5 acre (1 ha) land parcels currently in production, at a rate of 321 gallons per acre, daily. However with the drought, this seemed like it might not be enough. 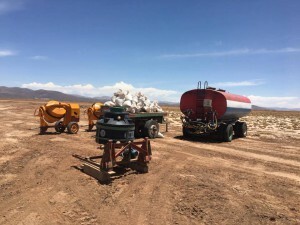 With the planning season almost at an end and no rain in sight, agronomists decided to go ahead and plant a few dozen more parcels, hoping for rainfall, and experimenting with their irrigation methods. Currently the spray did not seem to be penetrating the soil enough to promote germination, the agronomists and Paola were worried about what this would been for the project. Moth capturing system with pheromones made in Europe. Seed planting was done in a way I had never imagined, and according to Paola, has never been undertaking by anyone else either. A slurry of composted cow, sheep and llama manure was mixed in large industrial mixers with sand and water to create a highly nutritious muck. Quinoa seeds were added to this and the entire mess encapsulated into golf ball sized seed capsules which would dissolve in the muddy soil, giving he pre-germinated quinoa an extra boost. Unfortunately with the dryness, it was not known if the capsules would simply dry up and harden – trapping the sprouted seedlings. The last planting had been done 5 days previously, with no rain in sight. Traditionally, quinoa seeds could stay in dry soils for up to 3 weeks and still be viable when the rains came. 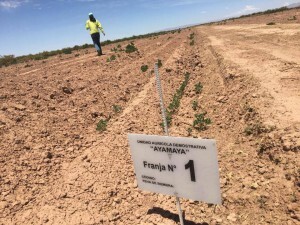 But it was unknown what an already sprouted seed would do in such drought conditions -Ayamaya’s current irrigation method was not set up to saturate the soils like rain does. Fingers crossed they get some rain! We went on to examine the organic moth control system they had set up across the site. This consisted of a 2-liter soda bottle bottom affixed to a plastic trap that consisted of a covered top, a pheromone plug made in a European laboratory, and a cross section that led male moths to a funnel and into he soda bottle bottom where they became trapped. Traps were hung on metal wire hangers and placed at about 2 per every acre (4 per ha). 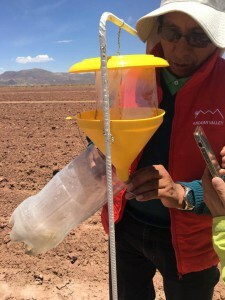 The cost $2.5 and were currently being distributed by PROIMPA, a Bolivia counterpart of mine and agronomy NGO. After driving around the site a bit, we packed up and headed back to the city. All a bit more quiet and pensive as the unknown consequences of the lack of rain fell heavily on the project developers.